As indicated by its name, Freeview means viewing at no charge. No contract is required for this, but your TV aerial needs to be up to the job. To view Digital Freeview channels you will need a digital television, a Freeview box or a Freeview PVR (PVR allows you to watch one digital channel while recording another). It is not necessary to buy a new television. A Freeview receiver will even work on an old black and white television. 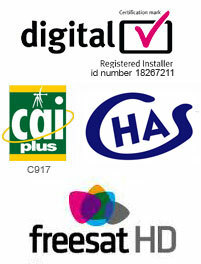 We can supply the equipment that you require or offer an installation service for equipment you have purchased yourself.